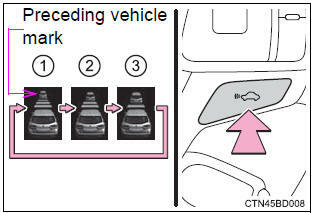 The vehicle-to-vehicle distance is set automatically to long mode when the engine switch is turned to ignition on mode. If a vehicle is running ahead of you, the preceding vehicle mark will also be displayed. Select a distance from the table below. Note that the distances shown correspond to a vehicle speed of 50 mph (80 km/h). Vehicle-to-vehicle distance increases/decreases in accordance with vehicle speed.